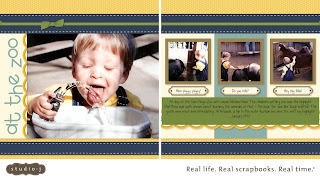 This layout features one of our kits that is no longer available in real paper - only online in Studio J - called Magic Moments. I love that my favorite kits will always "live" in Studio J even when I can no longer purchase the paper packs. I love re-living these memories! My son was only about 1 1/2 years old - not too sure about the animals in the petting zoo, but thrilled with the water fountain! He was such a cutie. When they are this age, you just want to scoop them up in your arms and love all over them all day long! Would you like to learn this fast, easy, and beautiful method of scrapbooking? Contact me to arrange a FREE one-on-one training session or click here to start playing on your own!